We usually use words like “immensely powerful” and “destructive” to describe Earth’s tectonic forces. But to artist Ken Goldberg of the University of California, Berkeley, even the most violent agents on Earth have an inner beauty. Bloom, a series of artworks that depict minute movements around the Hayward Fault Zone in California, is Goldberg’s latest expression of Earth’s tectonic majesty. 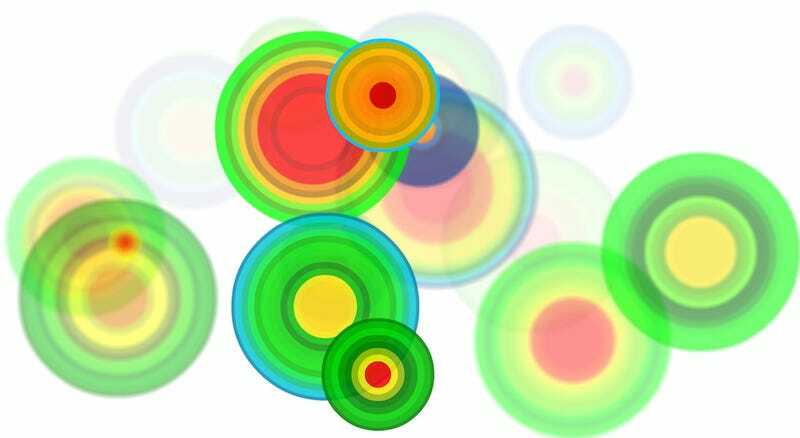 Created in collaboration with Sanjay Krishnan of UC Berkeley, and Fernanda Viégas and Martin Wattenberg of Google’s Big Picture data visualization group, each image in the series is actually a sophisticated visualization of real-time data on the vertical velocity of the Earth, collected off a seismograph and processed to generate an evolving field of.....lollipops? Flowers? Forces of mass destruction? You decide. The horizontal position of each of the blooms is based on time, while its vertical position is based on the magnitude of the rate of change of motion detected at the seismograph. Large tectonic tremors create big blooms, small jitters are tiny buds. Add some splashy, vibrant colors, and you’ve got yourself a hypnotically soothing seismograph readout. Now those are four words I never thought I’d string together. Bloom was commissioned by the Nevada Museum of Art and is dedicated to Color Field painter Kenneth Noland (1924-2010). Read more about the history of the project here.